Just Jingle: Two Giveaway Winners and Some Fun Tags! This is my second post of the day! To check out the Skipping Stones Blog Hop and Giveaway Head HERE! I have two winners to announce! First up, we have the winner of Melissa Ann Goodwin's book...Congratulations to Becky Dunham!!! You have won the book! Please contact me with your name and mailing information so I can pass it on to Melissa! Thank you! And now for the winner of the Ribbon Box from The Original Scrapbox as well as a chance to win the beautiful worktop....April Taylor! Please contact me with your full name and mailing information so I can pass it on to the sponsor! Winners - you have 24 hours to contact me. If I do not hear from you, a new winner will be drawn. Now...onto my fun tags! The challenge over at CASual Fridays this week is to create a clean and simple tag design. Since I was totally in the mood to make tags, anyway, this was a fun one for me to jump in on! These were so simple, and I LOVE THEM! I used Sally the Cricut to cut the trees in two sizes. Okay...so actually, I told Sally to cut the trees in one size, then I told her to cut some other stuff and Sally sort of decided that she is making her own decisions now and randomly cut some of the previous cuts in new sizes this time, so I just decided to go with it. HA! BUT...anyway, I cut the trees from the Art Philosophy cartridge and then stamped them with the coordinating CTMH stamps. LOVE!!!! I secured the two pieces with a simple brad and then added a bit of twine from The Twinery to finish them off! Nice and easy and OH. SO. CUTE!!! I kinda love 'em. Just say'n. So, that's my tags for today. I hope you love them. Have a super duper happy Tuesday! YAY! These are so cute! Love the trees! These tags are sweet - especially love the little baby ones with the sentiment! these are just to cute! love the stamp you used! Too cute! I love the matching stamps. Your tags are so cute. 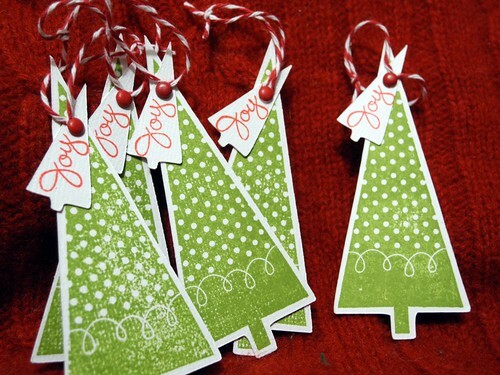 Love your tags great Idea and beautifully stamped. totally love your tags! must be something going around, my machine was playing up yesterday, just refused to cut out some mittens! Congrats to the winners!! 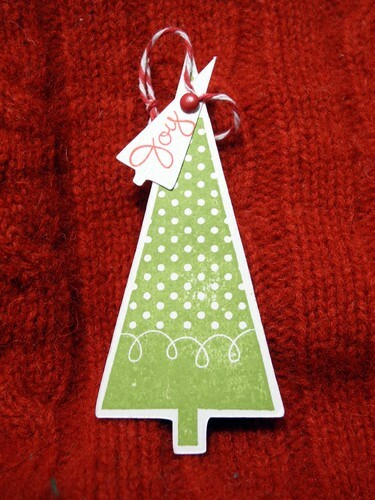 EEEK...those little tree tags are simply adorable! These are downright amazing, I adore the shapes and the little tag on top. Thanks for playing at CAS-ual Fridays too! Those are the cutest trees ever! Lovely work! Gorgeous tags love the stamping. Yes, so simple...and cheerful and special. oh oh oh!!!! I won Melissa's book? I am so excited about this! I actually entered to win this book at a couple of blogs - it looks so cute! And I checked out the book fair at my daughter's school with no luck. I was actually going to call another school and see when their book fair was :) Thanks so much Jingle! I will email you right away!